When I first saw the bike, I was absorbed by the unique half-packed drop-shaped fuel tank and chrome-plated tank cover. The whole finishing of this bike is also satisfactory. The modern body design creates a plump and stylish feeling. The headlight gives the impression of a big bike. It gives the bike an impressive looking which makes you desperately want to walk around and see what the rest of the bike looks like. The green color on the test bike really suited it well. The color of the bike gave it more personality, the wheels are black alloy with some areas left unpainted and they contrast really nicely with the green on the bike. I suddenly have the impulse to purchase one so that I can enjoy the handsome bike with black engine and accessories. Once I straddled on this bike, I found its seat is wide and I felt very comfortable. It has a streamline steel storage rack which can carry goods and is very functional. I couldn’t wait to start up this bike, and its digital meter clearly shown all the information with LED back light which made my eyes comfortable. The technicians from Haojin told me that the displacement of this bike is 139cc which is not too big but just hits the spot and can provide enough power. The engine is equipped with built-in balance shaft which brings stable riding experience. All these made me feel exciting. I couldn’t wait to gallop on Taurus along the mountain road in Chebaling National Nature Reserve in Shixing County and experiencing the handling performance of this cruiser. 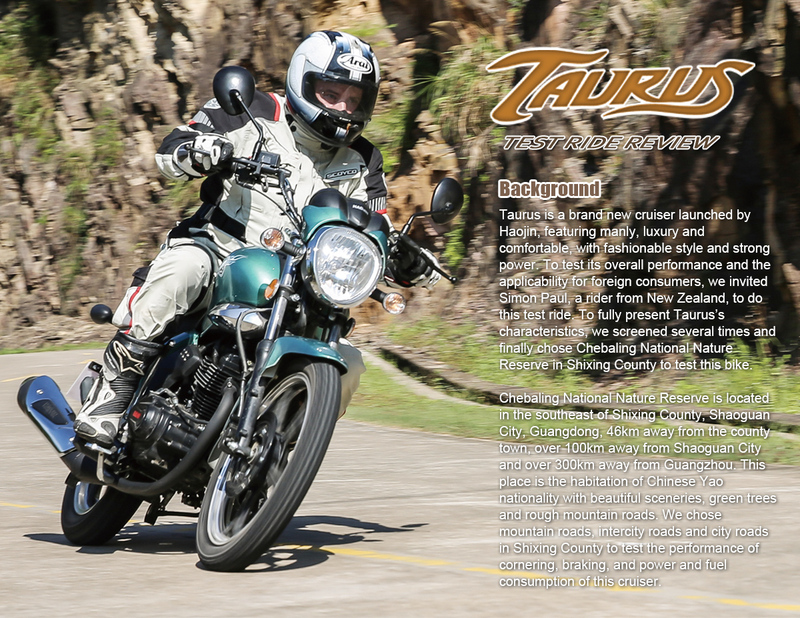 As I roared along the mountain road on the TAURUS, the 139cc air-cooling engine behaved more forceful than I had expected. Its Max. output is 7.5kw/8500rpm and the Max. torque is 8.8N.m/7000rpm. 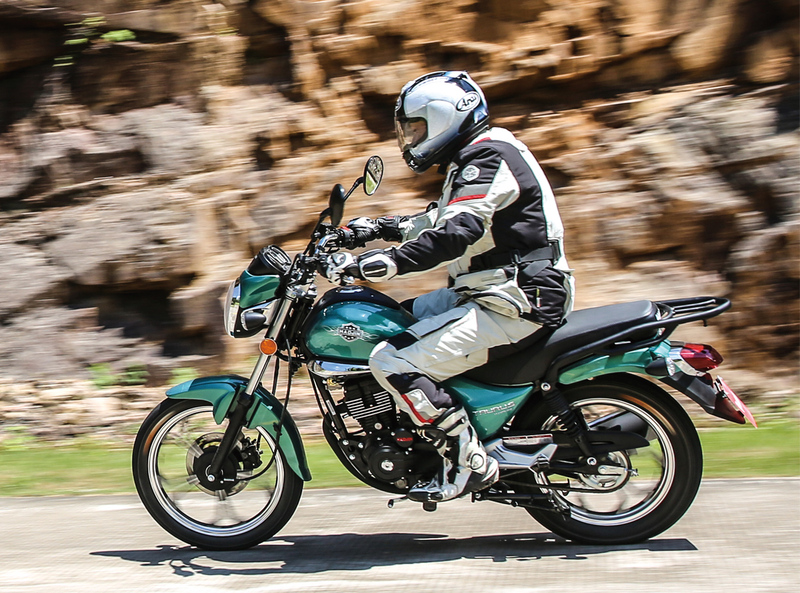 The engine provides quite reasonable power for only a 139cc displacement. As I kicked the throttle open, the engine roared me forward with a burst of drive force, and the bike spluttered into life with a deep, rich exhaust note along the road to Chebaling National Nature Reserve in Shixing County. The engine of Taurus is equipped with a built-in balance shaft which provides strong power, good durability and low fuel consumption. During the test riding, TAURUS ran vigorously and smoothly all the way up and I could not feel much vibration from the engine. The bike easily ran out a top speed of 102 kph. To test the fuel consumption of this bike, we tested twice and got the average value. At the first time, we rode for 50km and the fuel consumption was 1450ml. At the second time, we also rode for 50km and the fuel consumption was 1670ml. So the average fuel consumption is 3.12L per 100km. It’s very economical considering the rough road condition. I found it a little bit difficult at first to get used to the gear box as it goes round in a circle, pushing down on the front of the lever to change up and pushing down on the back of the lever to change down, for I am familiar with the handling of a 1 down 5 up gearbox. However, after about 50 odd kilometers I got used to it, so it was just a little bit of a learning curve for me. Once I got used to the method of changing gear, the gearbox seemed nice and smooth and the clutch actuated nicely and did its job as it should. Braking performance is provided by a large-diameter double-piston caliper with 240mm disc on the front wheel. The front and rear brakes felt a little spongy sometime, but there was enough braking force though, and the front caliper has adequate power for the front. The front just stayed online even if there were potholes or an uneven road surface. The only complaint with the front is that when you brake really heavy the front dives a little too much, but this is only under high speed cornering. For everyday normal use both the front and rear brakes are adequate. The suspension setup on the bike is really great. It inspires confidence when you are riding at comfortable speeds. The tires that come standard on the bike stuck to the road really well. They don’t have wide profile, but I did not once feel the need to back off because of the feeling that neither the front nor the back wheel was going to lose traction. The bike felt really safe in terms of cornering for beginner riders, for it did not do anything out of the ordinary. Any beginner would feel comfortable on it. Taurus’ overall handling really inspires confidence, and especially it sits in the corner without predictability. During the test ride I did ride the bike quite hard, pushing it to its limits, but the handling actually put a smile on my face. While going round quite tight corners with the throttle wide open and the pegs nearly scraping the ground, it actually rode a corner like a true big bike. When I reached the end of the test route, I found that the logistics support car had been left far behind Taurus. This made me feel that Taurus is extremely good for rounding a bend. A little accident was that when I once took one corner a little too fast during the photo shoot, there was a really big bump in the road, the suspension bottomed out, but finally I safely passed through. It really inspired my confidence to Taurus. HAOJIN gives great emphasis on the ergonomics. I feel I could ride TAURUS all day without feeling tired. The instrument layout is user-friendly and the digital display has a good array of information, displaying amount of fuel remaining, what gear you are in, the trip meter and odometer etc. The upright sitting position couples reasonably with the angle of the handle bar. The test ride covered different road surfaces including hill road at the scenic region, suburban highway, and city road in Shixing county. For the total distance of more than 200km, I felt free and relaxed. The handle bar position gives the bike a good turning radius and the bars come nowhere near the tank, which makes those U turns easier. I tested that a lot as I rode back and forth for the photographer to take more and better shoots. I am 175 cm, so the bike was suitable for me and I felt comfortable, and still there is ample room for taller riders to fit their longer legs. I rode about 200 km on the bike all up and it was a surprisingly enjoyable 200 km. I felt like I could have ridden the bike 500km and still my backside would not have any complaints as the seat has adequate padding. The foot pegs are a combination of steel and rubber, so there were no bad vibrations through the peg and I did not end up with sore feet. 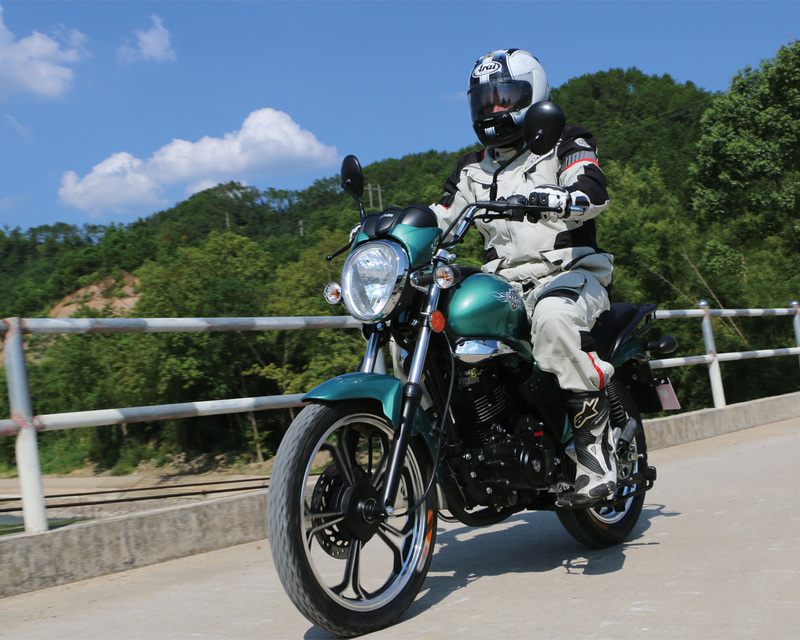 I have been riding big, speedy motorcycles for years, while HAOJIN TRAURUS gives me quite different yet comfortable feeling. It is a bike for everyday life. I love the body design, the color blending, the power support, the handling, and the riding experience, for together they make TRAURUS a comfortable cruiser worthy of the name. HAOJIN targets the main market of the TRAURUS to Africa, South America and the Middle East, which I think is a deliberate strategy, since such an American style and practicable cruiser must be quite fresh, most importantly appealing to the friends all over the world.